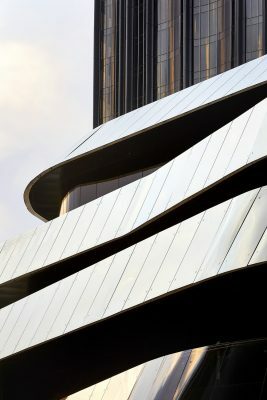 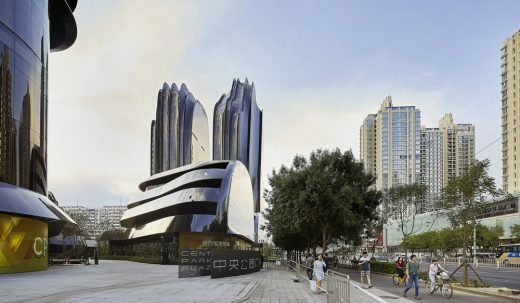 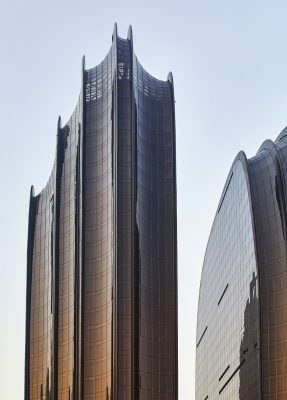 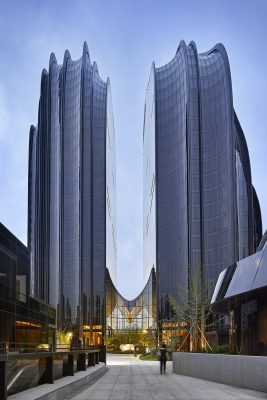 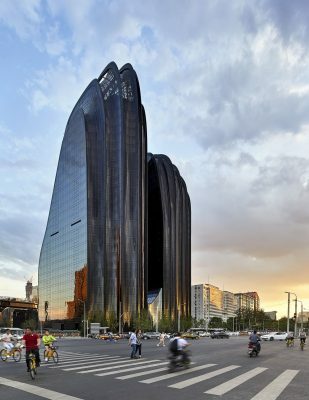 Dec. 5th, Beijing – MAD Architects, led by Ma Yansong, has completed the “Chaoyang Park Plaza”, which includes the Armani apartment complex. 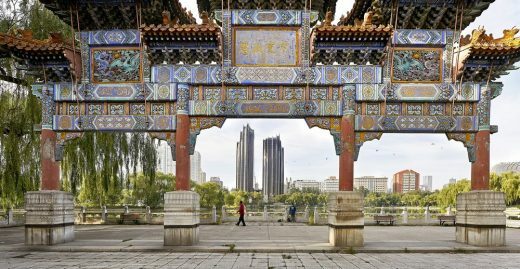 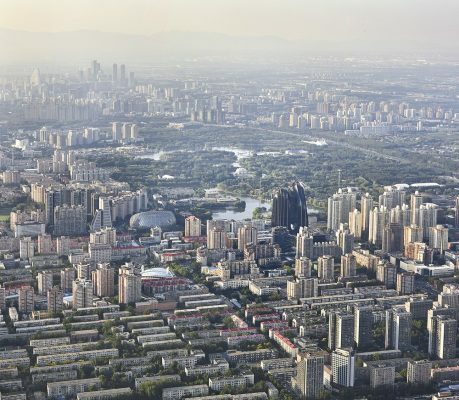 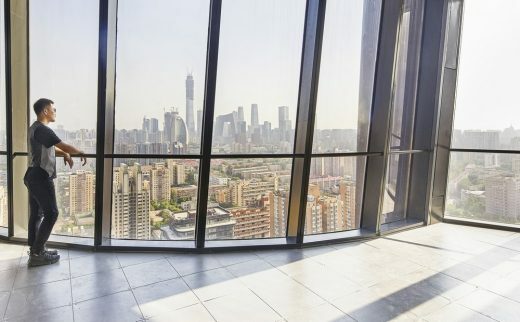 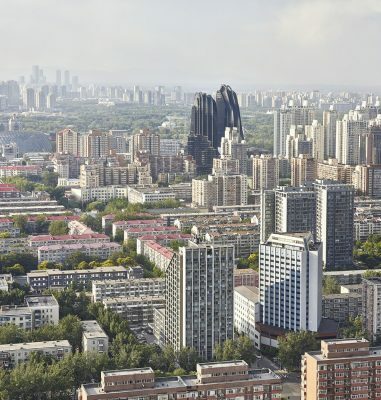 Positioned on the southern edge of Beijing’s Chaoyang Park ─ the largest remaining park in Beijing’s central business district area ─ the 220,000 sqm complex includes 10 buildings which unfold as a classic Shanshui painting on an urban scale. 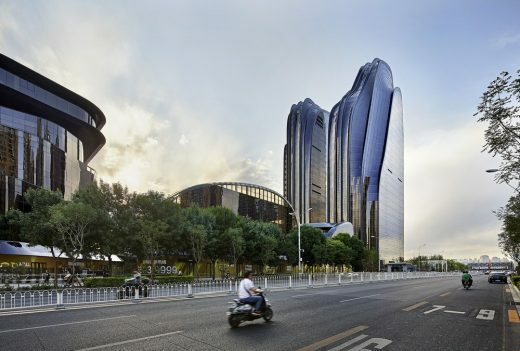 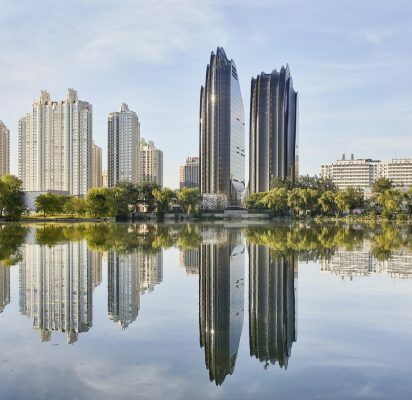 Having a similar position and function as Central Park in Manhattan, but unlike the modern box-like buildings that only create a separation between the park and the city, “Chaoyang Park Plaza” instead is an expansion of nature. 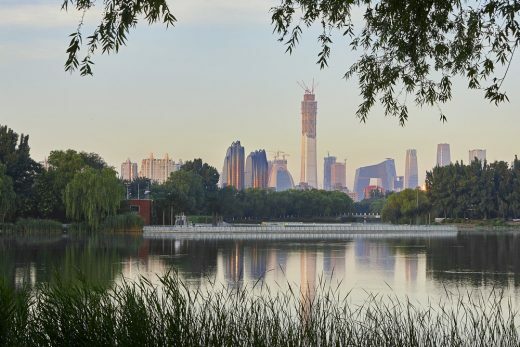 It is an extension of the park into the city, naturalizing the CBD’s strong artificial skyline, borrowing scenery from a distant landscape ─ a classical approach to Chinese garden architecture, where nature and architecture blend into one another. 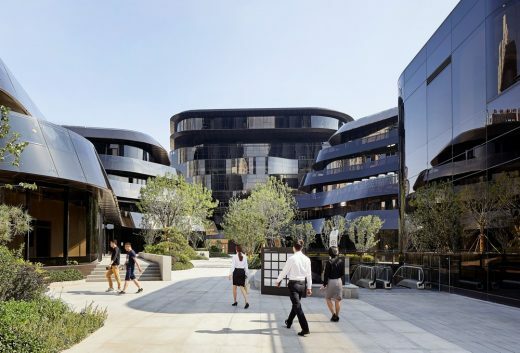 Inspired by traditional Chinese landscape paintings, the design remodels the relationship of large-scale architecture within our urban centers. 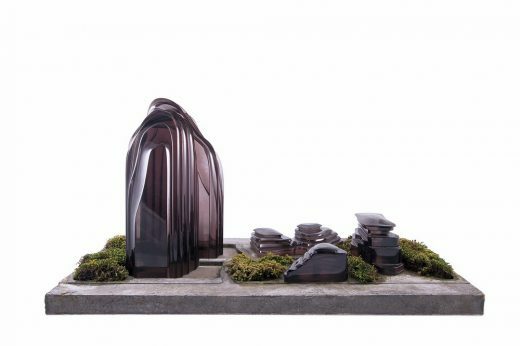 It introduces natural forms and spaces ─ “mountain, brook, creek, rocks, valley and forest” ─ into the city. 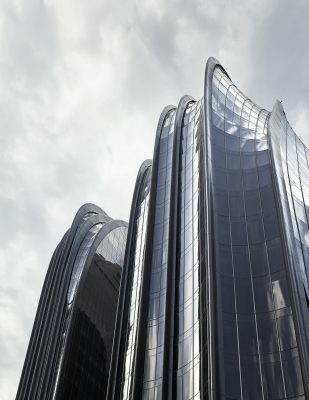 The overall environment is shaped by smooth, curved surfaces of black and white, creating a quiet and mysterious atmosphere. 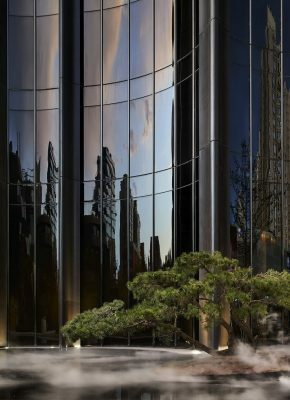 It is one that evokes the emotion and aesthetic resonance of a traditional Chinese ink painting, creating a tranquil escape from the surrounding, bustling urban environment. 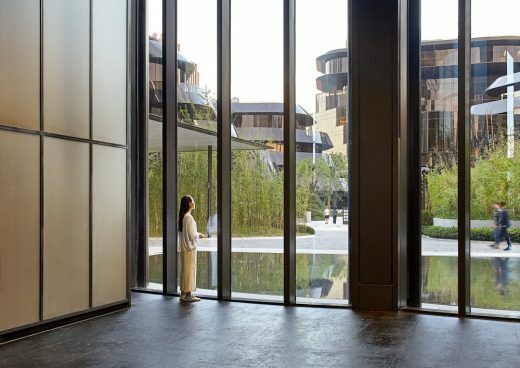 The landscape that weaves itself in between the buildings incorporates pine trees, bamboo, rocks and ponds ─ all traditional Eastern landscape elements that imply a deeper connection between the architecture and classical space. 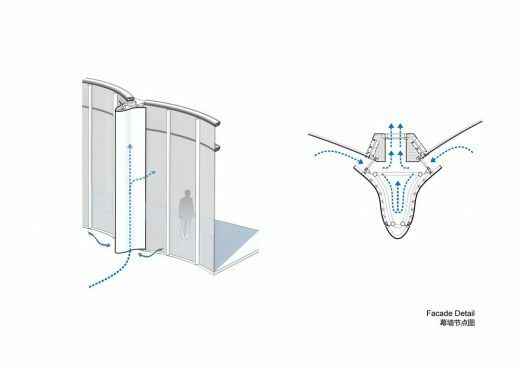 Japanese graphic artist Kenya Hara led the design of the “simple” and “refined” signage system for the project. 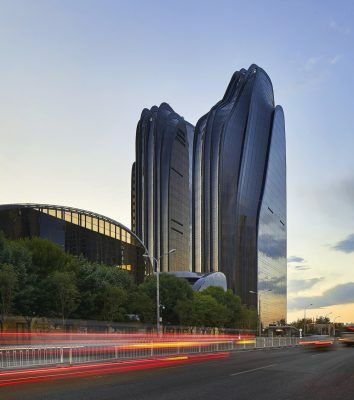 The project has been awarded the LEED Gold Certification by the US Green Building Council, as the ideal of “nature” is not only embodied in the design concept, but in the innovation and integration of green technology as well. 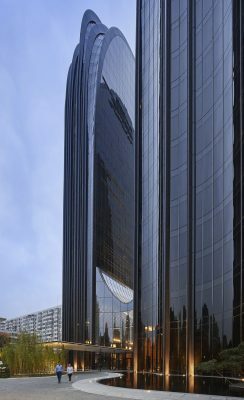 The vertical fins seen on the exterior glass façade emphasize the smoothness and verticality of the towers. 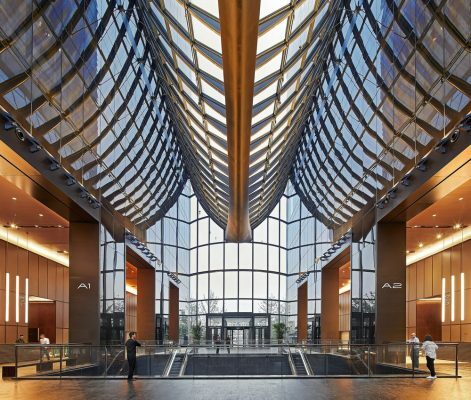 They also function as the energy efficient ventilation and filtration system, drawing fresh air indoors. 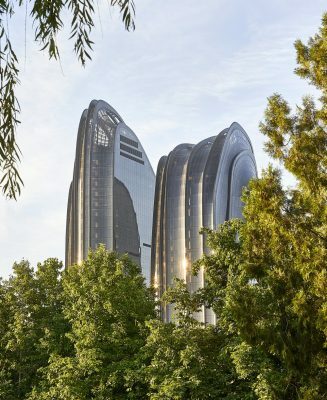 At the base of the towers, there is a pond, that while making them appear as if they are going into infinity, works as an air cooling system in the summer, decreasing the overall temperature of the interior. 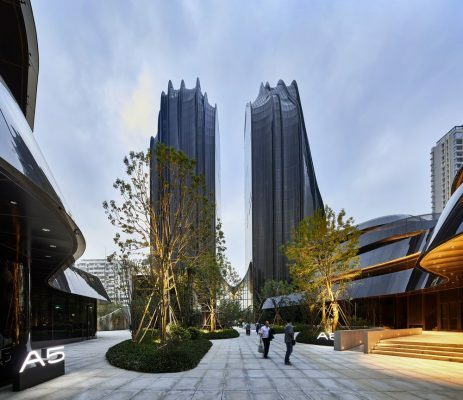 “Chaoyang Park Plaza” completely transforms the model of building found in our cities’ central business districts. 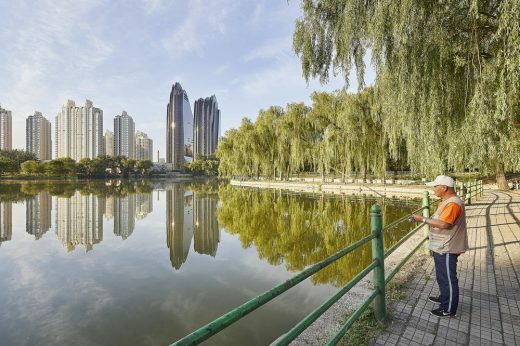 But even though it is located in the center of Beijing’s CBD, the intention is for it to have a dialogue with the traditional and classical city of Beijing – reflecting the interdependence between man and nature, both in urban planning, and the large-scale presentation of the Shanshui garden. 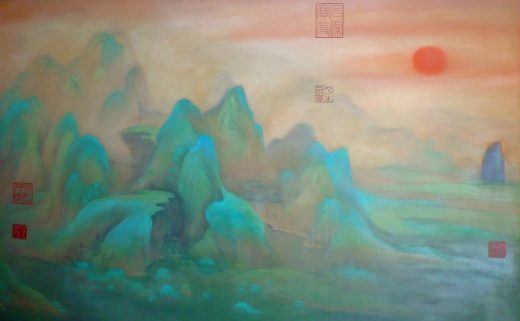 In the painting of Wang Mingxian, an architectural historian, he juxtaposed “Chaoyang Park Plaza” into a classical landscape painting. 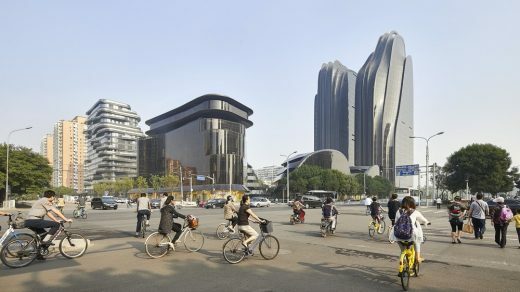 The architecture and the natural scenery seemed harmonious together, unlike how some might think the buildings do not fit into their urban context. 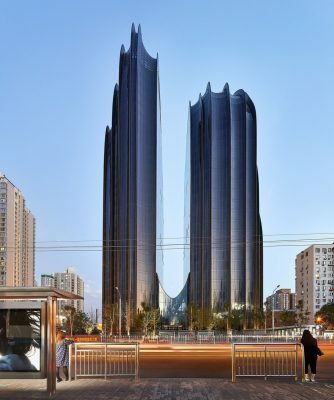 Commenting on this contrast, Ma Yansong said: “I don’t think that’s our problem.